Encircled by unsurpassed natural beauty, experience a visual and sensory feast that has topped the lists of numerous gastronomes. Fashioned after traditional houses and adorned with stone-carved statues and traditional paintings, it exudes an air of Asian elegance and evokes a sense of being away from Kuala Lumpur. The team is led by a pioneer of Tamarind Restaurants, Executive Chef Somkuhan Wandee from Chiang Mai in Northern Thailand. The very first chef who opened Tamarind Hill Kuala Lumpur in 1999 and Tamarind Springs over a decade ago, Chef Somkuhan continues to play a key role in winning acclaimed and prestigious awards. 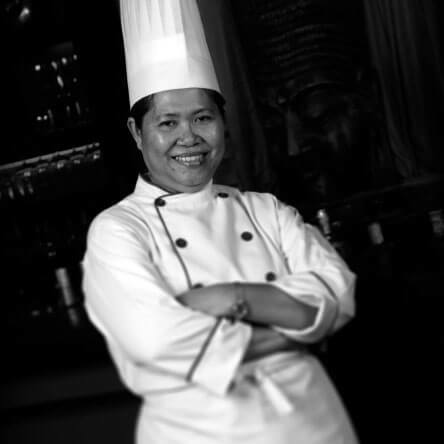 Inspired by her grandmother who once served the King of Siam, and trained under the tutelage of her mother, she continues to uphold her family's culinary philosophies, creating dishes from the freshest ingredients and never compromising on quality. For last minute reservations, please contact us directly at +603 4256 9300.